Why Hyper-local Marketing Works #Infographic ~ Visualistan '+g+"
For consumers, reputation matters. In an age where social media is king, not much gets past vigilant consumers and poor professional behavior can have serious repercussions. The inverse, however, is also true. Businesses that use their marketing power to reach out to their neighborhoods, support community growth with involvement, sponsor charity events, and generally “do good” are more likely to be looked on favorably by not just their own communities, but their customers at large. For those smart businesses that practice corporate sponsorship, 80% are satisfied with the results. By putting a face to a company name through charity drives, 5k run/walks, and general community support, businesses can expect marked and unique returns. Becoming a household name is a milestone for businesses of any size, and even on a local level this kind of recognition can make or break the future of corporations. 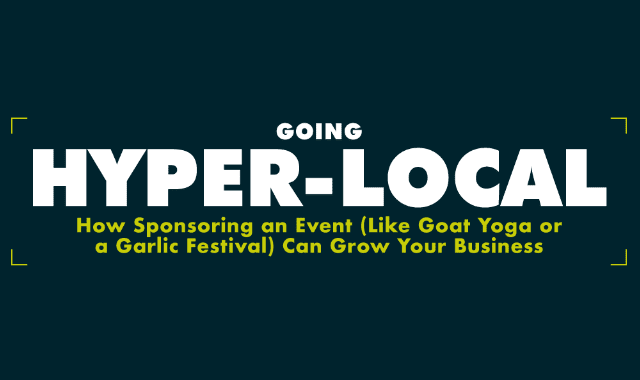 Ready to go hyper-local? Take a look at this infographic brought to you by Zipsprout for more on local event sponsorship, how it contributes to business growth, stimulates local economies, and puts a positive face on businesses of any size.